Prominent polycarbonate films market contenders have been accumulating commendable returns since the last few years with increasing acceptance for polycarbonate films mainly across the automotive as well as construction sectors. The ability of polycarbonate films to withstand a high-temperature working environment, their ease of printing, electrical resistivity, and high optical clarity have been fueling the industry expansion. Taking into account these highly effective mechanical and heat resistance properties & stability, leading solution providers across the insulation, printing, lamination, optical, and surface coating applications have been giving preference for polycarbonate films. The surging use of these films for manufacturing membrane switches, label nameplates, diffusion films, automotive instrument panels, and helmet insulation is poised to stimulate polycarbonate films industry share. The commendable expansion of the automotive sector over the last few years has been prompting giants in polycarbonate films market to develop a new range of products for myriad applications. In addition, the increasing popularity of energy security and shifting focus of the regulators toward deployment of e-vehicles will also increase polycarbonate sales over the years ahead. While designing the components of e-vehicles, designers give preference to lightweight, high strength, and structurally flexible materials in order to achieve manufacturing optimization. The increasing demand to maintain these effective design features in e-vehicles is slated to push industry trends over the years ahead. In line with the aforementioned fact, recently, leading thermoplastic supplier Sabic developed a new material solution that will be used for overcoming various challenges regarding the manufacturing of connected, autonomous, and electric vehicles. This newly developed material solution will be used to manufacture lighter automotive components with regards to its capability to reduce the overall weight by nearly 40% to 60%. The increasing importance for energy efficiency while developing vehicles is yet another prominent driving force for the industry. Capacity expansions have emerged as a go-to technique for prominent players in polycarbonate films industry in order to consolidate their stance. For instance, recently, one of the renowned players in polycarbonate films market, Covestro revealed its plan to expand its film production facilities across myriad regions for meeting the surging product demand across Germany, China, Thailand, and U.S. The company plans to invest nearly 100 million euros that also includes expansion of logistics and associated infrastructure. Capacity expansions thus, will help resolve certain challenges in store for polycarbonate films industry players. Apart from capacity expansions, acquisitions are a prominent tried-and-tested strategy that the market contenders have been adopting lately. Recently in March 2018, Plaskolite, LLC acquired North America based polycarbonate sheet manufacturing unit of Covestro. This acquisition broadened the product portfolio and customer base of Plaskolite across North America. Apparently, this is one of the second businesses that has Plaskolite acquired from Covestro since 2012. 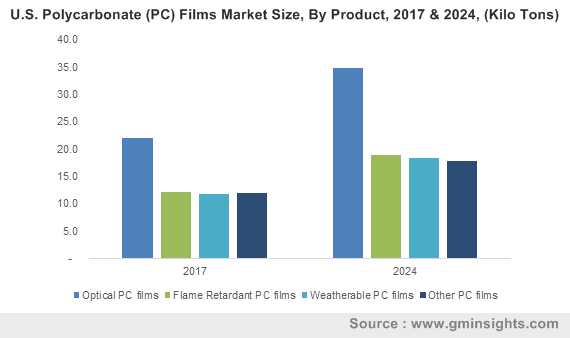 The current trends related to smart technologies, next-generation electronic equipment, and autonomous and electric vehicles are likely to give rise to a plethora of novelties across PC films market. The robust intervention of technology across the automotive sector will fuel the requirement of polycarbonate for car interiors – for sensing, lighting, and electronics devices. The addition of a broad range of futuristic features comprising face recognition and side-view cameras in newly developed vehicles is also slated to enhance product demand over the years ahead. As per a comprehensive report compiled by Global Market Insights, Inc., polycarbonate films market is poised to surpass a revenue collection of USD 2.4 billion by the end of the year 2024.